About 6 months ago Designer Magazine's London correspondent Will Slater wrote an article on the reported closure of Camden Market in which he gave a stern warning to our Manchester readers that if we don't stand up together, places like Afflecks Palace will be facing similar closure. It turns out that that prophecy is looking ever more likely with rumours circulating of un-renewed leases from owners Bruntwood or the fact that if the lease is renewed many traders will be forced out of business by rent increases which could be more than double their current rates. Afflecks Palace has been operating for 25 years and currently 100 traders operate in the Manchester institution, which is currently facing an uncertain future or a doomsday future come June 14th. 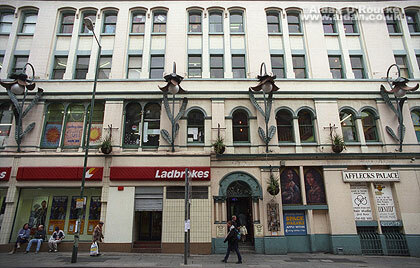 If the lease is not renewed could see the building turned into yet more expensive city centre flats or office space. Although it's not the place it once was, a place where Designer Magazine's editor used to buy Levellers and Chumbawamba T-shirts at cheaper prices than most bootleg t-shirts are now, it's still the one stop for rock kids or retro indie boys who trying to be Ricky from the Kaiser Chiefs. For each generation it's been the outlet of choice for those who want something different from the Top Shop high street stores. If Afflecks turns into flats it will have an effect which sends shudders through Manchester bigger than the IRA Bomb a number of years back. Councillors will start whispering the words "urban regeneration" in council meetings about the Northern Quarter, McDonalds and Starbucks will take the place of much loved cafe's such as Cafe Pop and the Koffee Pot and record shops are likely to be placed by a Tesco's Local. Sooner or later it will turn into a yuppies paradise mirroring Castlefield where the money talks and the bullsh*t walks. And how long before these new residents collectively group together and complain that venues such as Night & Day or Dry Bar are too loud? 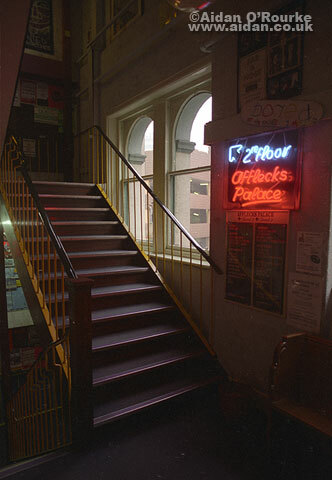 Bands have met and formed at Afflecks, it's the starting point for each generation realizing there's more out there than chainstores, but more importantly is we don't save Afflecks we could lose the Northern Quarter as we know it. "There are so many flats in Manchester - it's gutting to hear yet another valuable and rare small business space is now at threat to these developers.